With Yu Darvish signing with the Cubs, the free agent market finally has some movement at the top. The next domino to fall figures to be former Cubs starter Jake Arrieta. Earlier this offseason, the Twins and Brewers were the perceived favorites to sign him. That may still be the case, especially with a return to Chicago out of the question. But they aren’t the only teams with interest in signing Arrieta. Let’s take a fresh look at what teams have the best chance to end up signing Arrieta before the season. The Brewers remain determined to land an ace before the start of the season, and they definitely need one, especially with Darvish going to the Cubs. 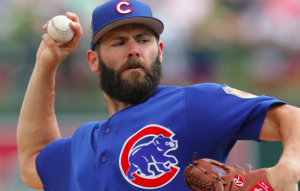 Arrieta is arguably the only free agent still available that fits the definition of ace, so Milwaukee figures to make a strong push to sign him. The Brewers reportedly made Darvish an offer of five years and around $100 million. Presumably, they could make Arrieta a similar offers, which would put them in good shape to sign him. There’s been enough of a connection between Arrieta and the Cardinals this winter to envision something happening. After all, the Cards will want to keep pace with the Cubs, and with Arrieta being given little attention by the Cubs this offseason, he may have a little extra incentive to sign with their biggest rival. St. Louis isn’t in desperate need of a starter. However, they could sign Arrieta and then try to trade some of their rotation depth for a closer, which they do need. The Nationals are a team to watch closely with Arrieta. Washington doesn’t appear enamored with the back end of their rotation or their rotation depth. Also, the Nationals may feel like they need to have four quality starters in their rotation in order to match up with the Cubs and Dodgers in the postseason, and possibly even the Mets if their starters are healthy. Philadelphia is another intriguing team that’s been linked to Arrieta this winter. The Phillies have a lot of young pitchers who hold promise, but they lack experience and a true ace. Needless to say, Arrieta would be fill that void. He would be a huge addition for them and a big stepping stone as they approach the end of their rebuild and get ready to start competing for the top spot in the NL East. The Twins were very much enamored with Darvish, even if they knew they weren’t going to get him. Much like the Brewers, there are reports that the Twins offered Darvish a contract worth around $100 million. Again, a similar offer would make them competitive in the Arrieta sweepstakes. With Ervin Santana set to begin the season on the DL, the Twins need a starter, and with Santana not guaranteed to be back after 2018, Arrieta could help lead Minnesota’s rotation both now and in the future. There’s been so little chatter about Arrieta for much of the winter that it’s possible a team comes out of nowhere to get him. There are also reports that Arrieta may consider a short-term deal with a high salary rather than a long-term deal. If that happens, it opens the door for a multitude of other teams to get involved, possibly the Angels, Blue Jays, Diamondbacks, Giants, Mets, Orioles, and Rangers. In short, it’s possible Arrieta ends up signing with a team few people would have predicted.